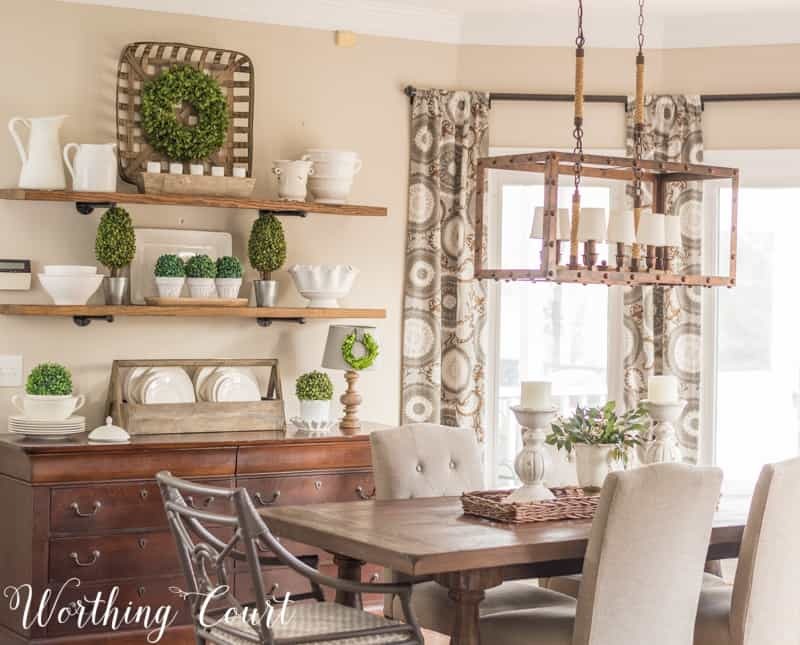 A room filled with fresh and easy spring decorations that you can copy in your own home. I think that by the time winter is drawing to a close (finally! ), all of us are ready to bring out our spring decorations to add a brighter and fresher look to our homes! Something to help us shake off all of the gray skies and drab colors of winter. Something to make our hearts and homes lighter and brighter. 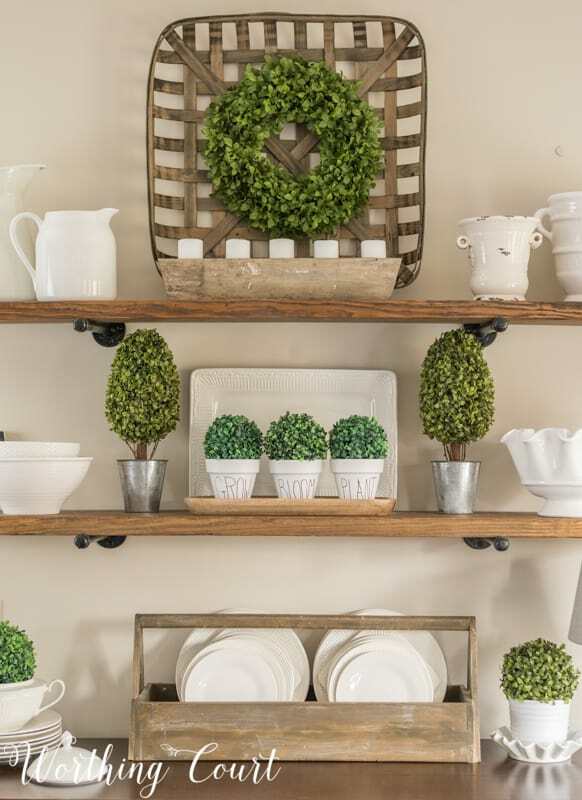 I can’t think of a more fresh color combination for spring than green and white. 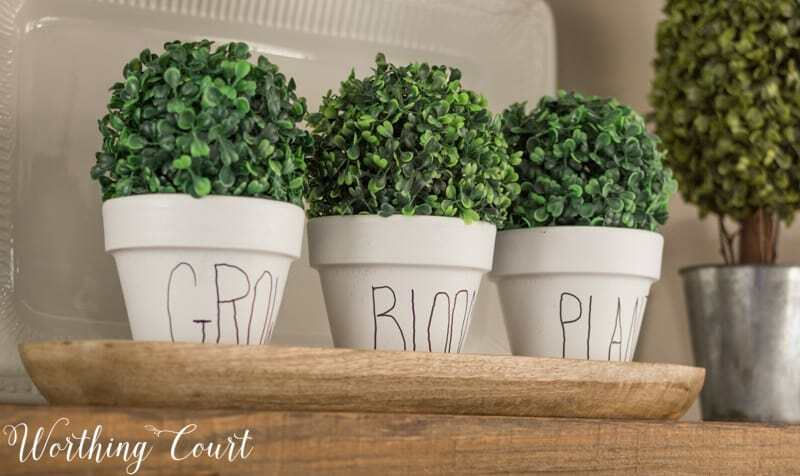 Using green helps to draw the outdoors in, even before all of the trees have leafed out, and combining it with white gives a fresh bright look to the whole room. 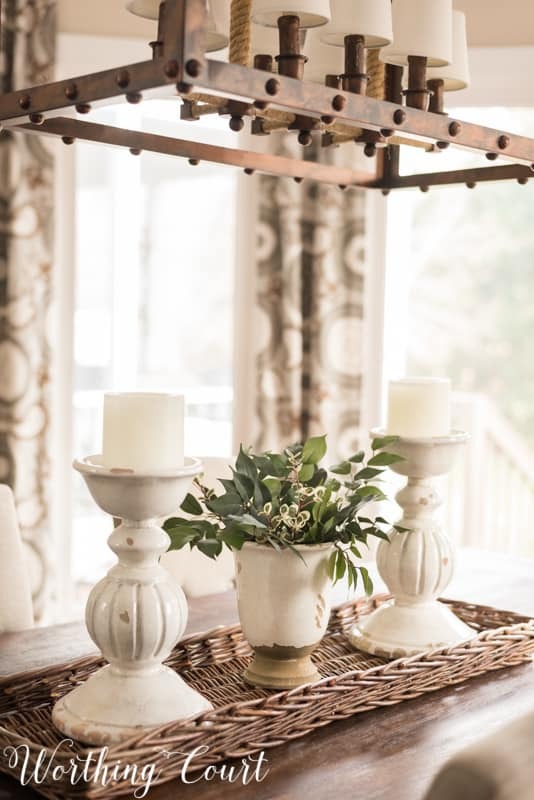 The spring decorations in my breakfast room this year are so easy! I pulled most of what you see here from my kitchen cabinets. A very few things came out of my decor stash and only two items were purchased. Resources are listed at the bottom of the page. 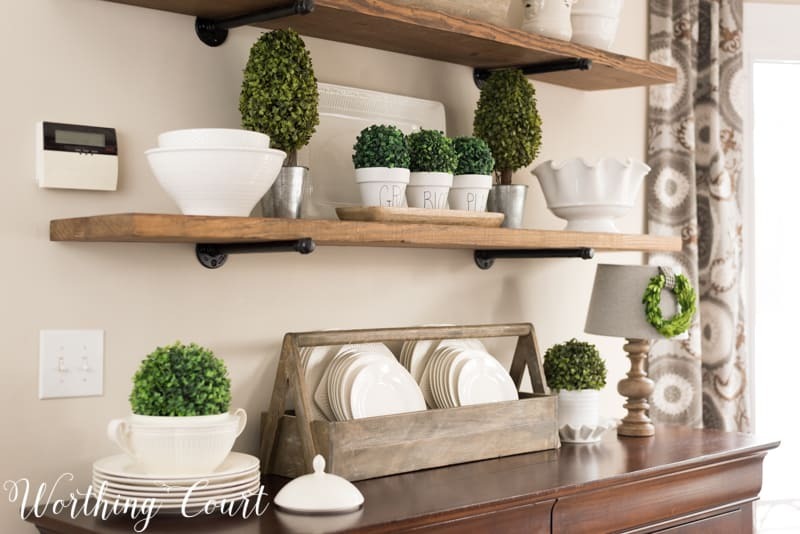 Whether you use green and white or some other color combo, you could copy this look so easily by raiding your own cabinets and combining your favorite dishes, bowls and serving pieces together. If you’re using all white dishes, you can accent with any color you like. If you’re using patterned dishes, keep it simple and uncluttered by pulling one color from the pattern and using that as an accent color. To tie the shelves in with the rest of the room, I added a super simple centerpiece to the table. 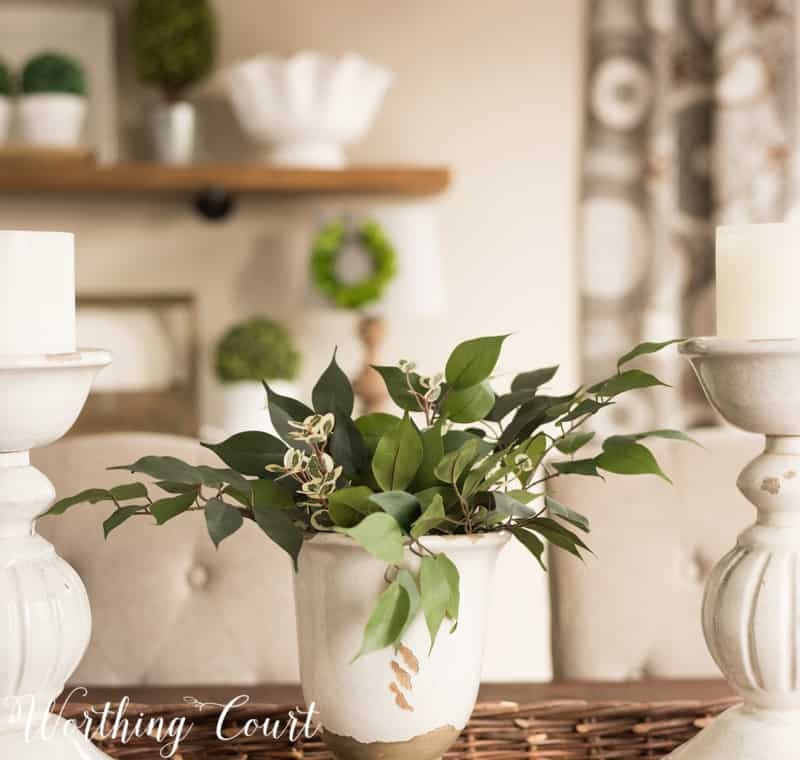 Fill a container with snips from an assortment of faux greenery bushes, add two candlesticks and place it all in a tray or basket that suits the shape of your table and voila! – a centerpiece in about five minutes! Let’s pull back and take a look at the whole room. Fresh, clean and simple for spring! Some links to products are affiliate links, which allow me to make a small commission from your purchase at no additional cost to you. See my full disclosure policy HERE. What a lovely room all dressed up for spring! I especially love the basket of tulips sitting next to your table….So pretty!!! I’ll second that! Do you remember where you found that basket? It has such wonderful texture! Hi Amanda. I probably got it at TJ Maxx, but I’ve had it for several years so I’m not positive. Yay! I’m not the only one that thinks it’s pretty much spring! 🙂 Decor looks pretty! I would like to know where you got your curtain rods and brackets. Thank you for sharing your sources. 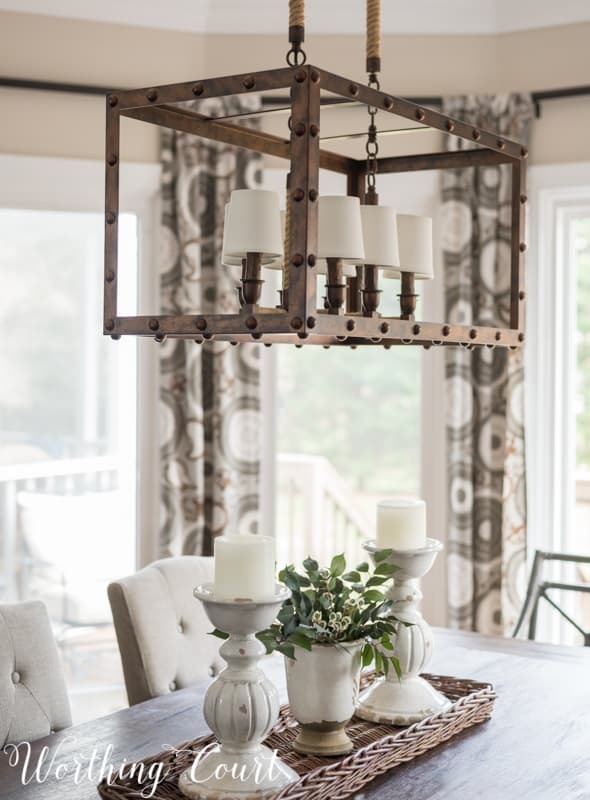 I am in the process of planning a dining room redo and I am going to have to check World Market for tables and Target for drapes. I love your room and am hoping to do something similar in my currently “too formal” and somewhat outdated dining room. Your color choices are right up my alley! 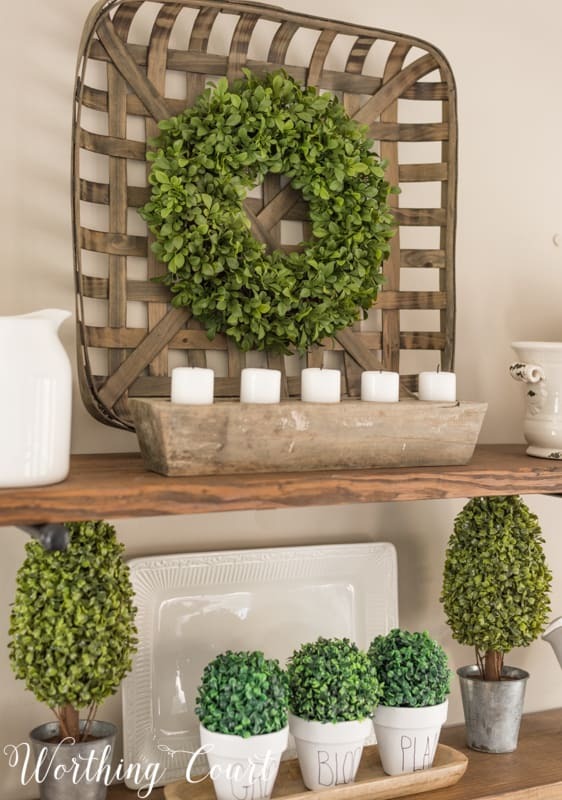 I love the freshness that green adds to your rooms! Everything is beautiful. Everything looks lovely, but your simple, elegant centerpiece stole my heart! I’m with you. After all the heavy stuff for winter, more whites and spring green feels so refreshing! I have a little more color in my house, so continue add minor touches of yellow and maybe a little purple as the spring progresses. 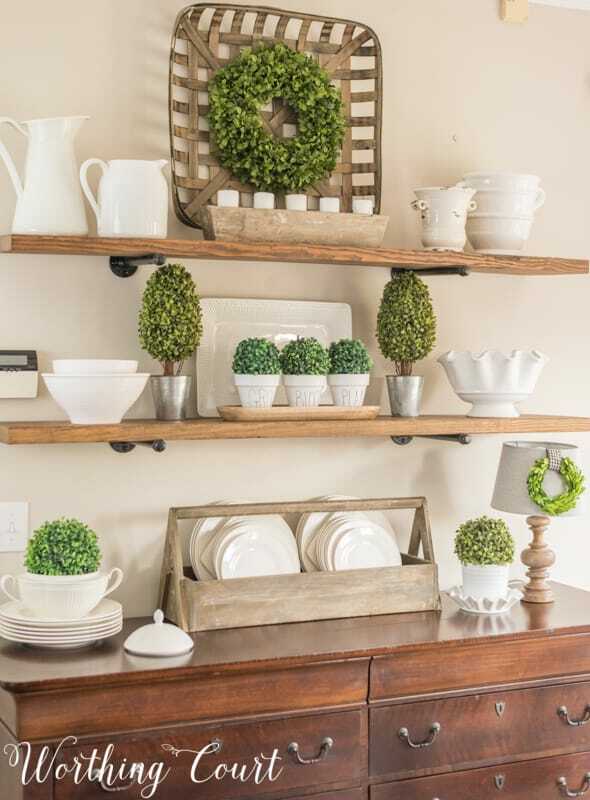 Love all the green & whites~ so fresh and crisp ~ so simple! Hi Suzy! Love the green and how it makes everything look so bright and fresh! Thanks for sharing! 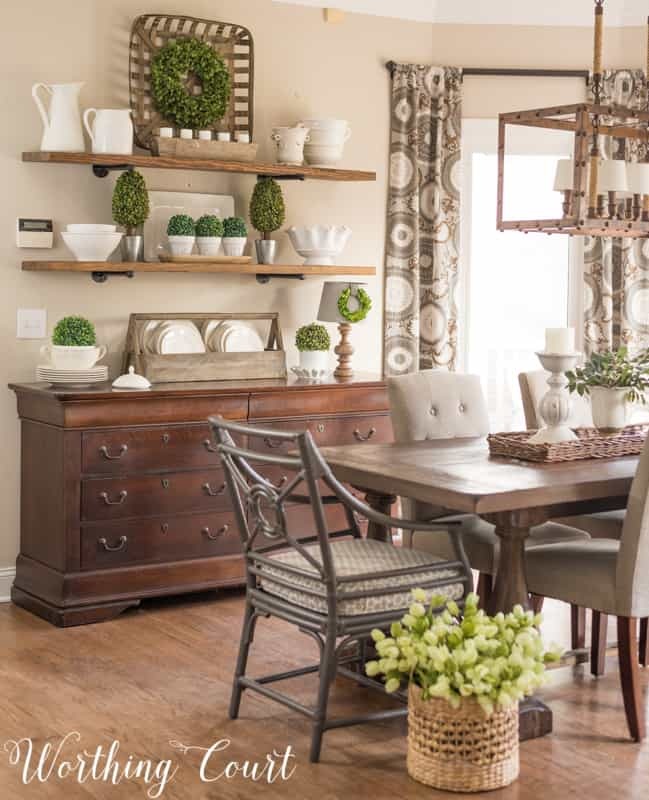 I love your fresh, clean, and simple approach to your breakfast room. It feels like Spring without being overwhelmingly cutsie. I think I tend to go overboard with pastels and bunnies when I should follow your look of simple white and spring greenery. Thanks for the inspiration!